Summary: Sequel to Dirk Gently's Holistic Detective Agency. A passenger check-in desk at London's Heathrow Airport goes up in a ball of flame and Dirk Gently becomes very inquisitive. Summary: This darkly satirical sf mystery is somewhat of a departure from Douglas Adams's internationally bestselling HITCHHIKER'S GUIDE TO THE GALAXY series. Richard MacDuff, a bemused computer programmer, is propelled into a series of mysterious but inextricably interconnected events, involving the odd behavior of an extremely absentminded Cambridge professor, the senseless murder of his boss, the true meaning of Coleridge's two most famous poems, and a horse stuck in a bathroom. Only Richard's old college friend Dirk Gently, a somewhat shady, possibly psychic, and perennially underemployed PI, can trace the pattern to its source: an ancient ghost searching for a hidden time machine. Although DIRK GENTLY has never reached the same popularity as the HITCHHIKER'S books, it has a certain cult classic status. Fans of the British television series DOCTOR WHO will find DIRK GENTLY of interest, as it borrows plot elements from two scripts that Douglas Adams wrote for the series: "City of Death" and "Shada" (the filming of the latter was never completed due to a labor dispute). 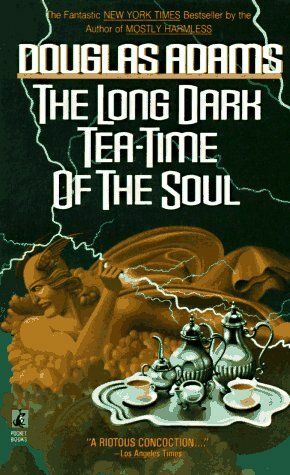 DIRK GENTLY'S HOLISTIC DETECTIVE AGENCY was followed by a second Dirk book, THE LONG DARK TEATIME OF THE SOUL. A third book in the series, THE SALMON OF DOUBT, was incomplete at the time of Adams's death; the work-in-progress, along with some of Adams's collected writings, was published in 2002.